Why should you avoid feeding birds on your property? Birds often are hosts to ticks, mites and fleas. If birds are nesting nearby, guess what also can end up in your yard, on your pet, and near your family? Nuisance birds also can be loud, waking up homeowners while they slumber. More importantly, birds can carry and transmit diseases, especially in their droppings. Bird droppings containing bacteria and parasites have a strong, unpleasant odor. In addition, the acidic droppings can ruin home and landscape aesthetics and cause serious illness in humans and pets. 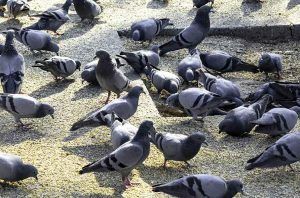 Bird droppings are highly corrosive and can damage plants, roofs, metal pipes, and other building materials. Large quantities of bird droppings can also clog drains, creating a problem during heavy rains in Florida. Finally, birds roosting in warehouses or commercial buildings can damage inventory and contaminate food products. What can you do to avoid having birds roost on your property? The first step is to remove the birds from your property, closely followed by step two which involves disinfecting the entire area where the birds were roosting. The third step is to implement a system of tactical deterrents designed to keep birds away. It’s probably not a great idea to “try it at home” unless you have significant experience working with birds. Birds can become aggressive, especially when you are near their nesting area. By going near the nest area, you are putting yourself at risk for transmission of parasitic and bacterial illness. The best advice is to “let the professionals handle it.” Pest control technicians are well-versed in the remove of birds and nests. Florida Pest Control Center (FPCC) provides several safe and effective ways to control nuisance birds in Florida homes, neighborhoods, and commercial and industrial properties. the spread of bird and bird dropping-related diseases. potential fire hazards caused by bird nest locations in vents and other dangerous. Locations. further damage to plants, sidewalks, roofs, and other building materials. Put deterrents in place so birds won’t return. How do we safely and humanely remove birds and their nests? Bird netting to prevent birds from nesting in certain locations. Visual and audio scare tactics designed to irritate, scare, and repel birds. Bird deterrents such as spikes to prevent birds from roosting. Harmless shocks to modify bird behavior. Bird birth control treatments to control large bird populations in urban areas. Florida Pest Control Center (FPCC) employs comprehensive, state-of-the art technologies, chemical, and non-chemical treatments to eliminate pest problems in residential homes, businesses, hospitals, medical facilities, group homes, and apartment and condominium buildings. Our highly trained professionals provide a fast, complete solution to your ants, mosquitoes, termites, bed bugs, birds, rodents, and other pest infestations.